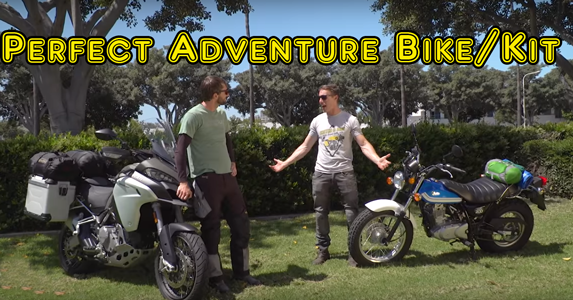 I love the video below because it illustrates well the two extremes of adventure motorcycles and gear. The whole idea of having a perfect bike for adventure is ludicrous, and hopefully after watching, you will agree. From my experience, there so often seems to be a reluctance to ride without proper tools (bike, gear, tents, etc.) and silly things like a perceived need of all-or-nothing solutions. This video perfectly points out many aspects of each choice that weighs in one direction or the other. The conclusion the guys come to is that the “perfect bike” is probably somewhere in the middle, while my conclusion is always Run what ya Brung. The clear illustration presented is that you can have an adventure regardless of the chosen tools, your budget, time or distance. So the takeaway is get on your bike and ride this weekend……to somewhere new or cool, with what you have.